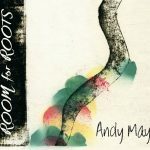 Andy talks about his upcoming release, Room for Roots, Acoustic Kids, and his many years at MerleFest. On the show, the interview was bracketed by Andy’s songs, Life’s a Gig and At the Fork in the Road, from Room for Roots, which is due out in April. You can hear deluxe clips of these songs, as well as all the others on “Roots,” and learn more about the album on the Room for Roots page.